While metrics are important in every aspect of business, they’re especially critical in sales. Sales leaders can’t use their intuition to guide their decisions -- not only are they dealing with a huge amount of information, the risk of failure is too high. That’s why successful companies obsessively measure everything about their go-to-market model, sales strategy, and salespeople. To help you find the numbers you need to be paying attention to, we’ve compiled the ultimate guide to sales metrics. The definition of a sales metric is a data point that represents individual, team, or company-wide performance. Sales leaders use sales metrics to track progress toward goals, prepare for the future, adjust sales compensation, award incentives and bonuses, spot problems before they get out of hand, and more. Sales metric and key performance indicator (KPI) are often used interchangeably -- but not every sales metric is a KPI. To qualify as a KPI, a sales metric must reflect a major business priority or objective. For example, a company trying to drive sales for a specific product might monitor that solution’s percentage of total sales. Meanwhile, a company aiming to get users more efficiently would monitor cost of acquisition (CAC). What is a KPI used for? Like any metric, leaders and managers use KPIs to evaluate performance. Unlike most metrics, a KPI is tied to the company’s core strategy. What is a KPI in sales? Not only do KPIs differ from company to company, they also differ from department to department. There isn’t a single set of sales metrics or KPIs each sales leader must monitor -- targets, roadblocks, products, structure, and so on vary so dramatically across sales teams. What is the difference between KRA and KPI? Key result areas (KRAs) are objectives an individual, team, department, or business unit must meet for the company to hit its objectives. For example, your sales team needs to penetrate 10% of the market in a particular region to unseat the incumbent. What is the meaning of sales target? A sales target, also known as a quota, is the amount of sales that a salesperson, sales manager, or sales leader commits to making in a set period of time. It can be measured by revenue (dollar value) or volume (units). These sales metrics show what salespeople are doing on a daily basis. Activity metrics are “manageable,” meaning sales managers can directly influence them. Imagine one of your reps isn’t hitting her quota. Digging into her activity metrics, you discover she isn’t sending enough emails to generate the number of calls she needs. 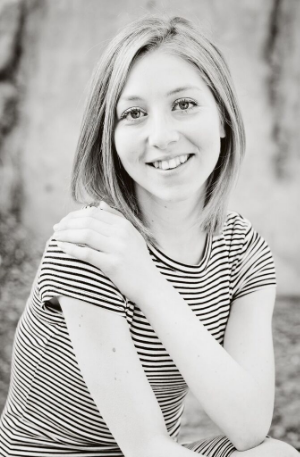 You can’t control how much this salesperson sells -- but you can tell her to increase her daily email output. Activity sales metrics are leading indicators. In other words, they predict your ultimate results. 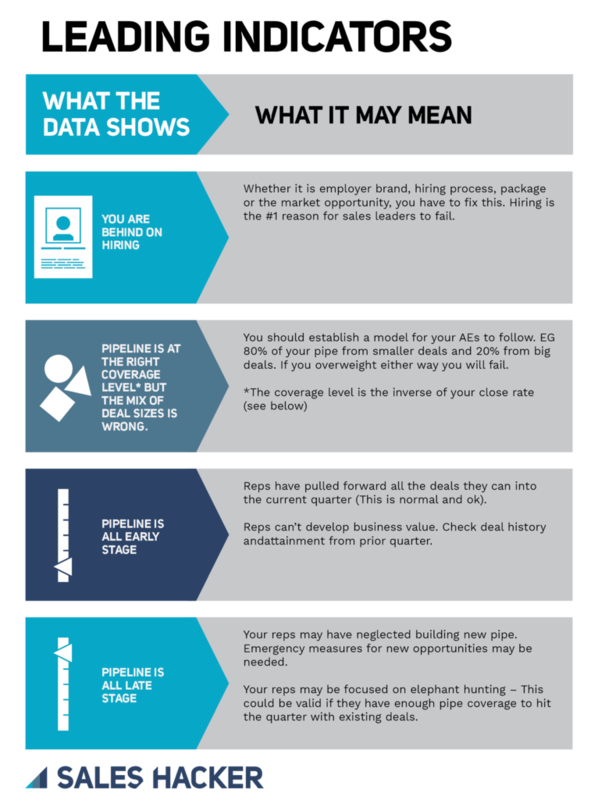 Gauge the health of your sales pipeline with these metrics. They help you understand what’s working and what’s not regarding your holistic sales process. How well are your salespeople prospecting? Use these metrics to find out. Some metrics in this category probably won’t be important to your company. It comes back to your individual sales process, methodology, and strategy: If your reps exclusively target prospects they’ve met at trade shows, average initial-contact-to-meeting rate would be a better reflection of their performance than average email open rate. These metrics will help you optimize your channel sales strategy. Sales productivity is defined at the rate at which your salespeople hit their revenue targets. The less time it takes a salesperson to meet her quota, the higher her sales productivity. Without a solid talent management strategy, hitting your targets becomes far harder. Nothing makes team quota slip further out of reach than unexpectedly losing a high (or even average) performer. Sales managers feel pressured to fill the role as quickly as possible, which often leads them to settle for a mediocre candidate. By relying on data to tell you when and how to recruit, you can avoid this issue. Sales ramp-up time represents the average amount of time it takes a new salesperson to become fully productive. Use it to make hiring and firing decisions, set expectations with new reps, and develop more accurate sales forecasts. There are multiple ways to calculate it. CRMs often automatically calculate the mean time to 100% quota attainment, which you can use to set ramp. For instance, if it typically takes a salesperson four months to hit 100% quota, your ramp-up time would be four months. Although this method is fairly simple, it ignores the fact new sales reps often take over existing accounts or prospects -- which gives them a head start. In addition, a salesperson who hits 98% of their quota is likely fully ramped, but this formula wouldn’t count them as such until they hit 100%. Alternatively, Ideal CEO Somen Mondal has developed a formula that factors in training, the length of your sales cycle, and prior experience. X is based on the salesperson’s experience: The more they have, the smaller this number is. Here’s an example for a well-seasoned rep, assuming training lasts 20 days and your average sales cycle is six weeks. This salesperson would receive 78 days to reach full productivity. Most companies invest heavily in sales enablement and training. To ensure your money is being spent wisely, track the following metrics. It’s relatively simple to gauge CRM and technology adoption: Simply look at your usage data. However, knowing how many reps are following your sales process is more challenging. Consider holding an anonymous survey with questions like, “Do you follow the outlined sales process with the majority of your prospects?”, “Do you use the prescribed needs assessment framework?”, and so on. You should also use blind surveys to learn how satisfied reps are with the quality, frequency, delivery method, and focus of your sales training program. A leading indicator predicts your results. In other words, it tells you which direction you're trending while there's still time to change the final outcome. While leading indicators can be more difficult to measure than lagging indicators, they're also far more easy to influence. A lagging indicator reflects your ultimate results. They're reactive, not proactive. For instance, a lagging indicator might be your team's quota attainment at the end of the month. SaaS and other recurring revenue businesses are different because the revenue for the service comes over an extended period of time (the customer lifetime). If a customer is happy with the service, they will stick around for a long time, and the profit that can be made from that customer will increase considerably. On the other hand if a customer is unhappy, they will churn quickly, and the business will likely lose money on the investment that they made to acquire that customer." Rather than solely focusing on acquiring the customer (the "first sale"), Skok explains you must also focus on keeping them (the "second sale"). Check out the sales KPIs you should track at each stage of your startup's growth. Cost of customer acquisition (CAC) is the average amount of sales and marketing expenses required to acquire one new customer. 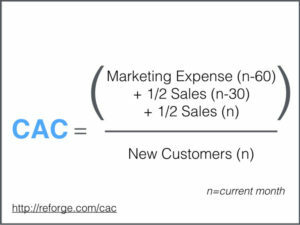 To calculate CAC, divide the total amount you spent on sales and marketing in a given time period by the number of customers you acquired in the same time period. For example, if you spent $1,000 in one month and acquired 50 customers, your CAC would be 20. This formula is easy to follow. But as HubSpot's former VP of Growth Brian Balfour explains, it can be inaccurate unless your prospects become customers extremely quickly or your marketing and sales expenses are static (which is unlikely). If you measure CAC by month, but it takes your typical prospect two months to buy after the first marketing touchpoint, your results will be misleading. Perhaps you start a new marketing campaign in January -- its impact on CAC won't be visible until February. Balfour also points out people commonly conflate "CAC" with "CPA" -- but the two are different, and this mistake can be expensive. CPA stands for Cost Per Acquisition. It represents how much money you need to spend to acquire a non-customer, like a lead, a free trial, a registration, or a user. This means CPA and CAC are related: Your CPA is a leading indicator of your CAC. For example, if you offer a freemium version of your software product, your CPA would measure the cost of acquiring a free user. Your CAC would measure the cost of acquiring a paid user. Startups must know how many months it takes to recover CAC, (the amount they invested in getting a new customer). Not only does this metric help you manage cash flow, it also tells you how long you need to retain a customer to break even. Let's say your CAC is $200, and your average revenue per account (ARPA) is $400. Your gross margin is 95%. Months to recover CAC = CAC divided by (ARPA x GM). In this example, you'd break even in approximately two weeks. Customer lifetime value (LTV) is the average amount of money your company makes from a buyer for however long they stay a customer (i.e., X months or years). LTV tells you whether you're spending too much or too little on acquiring customers. The optimal LTV:CAC ratio is 3:1. In other words, if it takes a dollar to get a prospect to buy your product, they'll spend $3 over their time as a customer. Figure out why Tier X customers are less profitable -- are they churning earlier, buying less, and/or purchasing fewer add-ons? Average Revenue Per Account (ARPA) is the mean amount of revenue from a single user or customer. Companies typically calculate it per month or year, depending on their business model. If you offer monthly contracts, calculate it on a per-month basis; if the majority of your contracts are annual, calculate it per year. Monthly Recurring Revenue (MRR) tracks the total predictable revenue your company expects to make each month. It's one of the most important sales metrics for SaaS businesses, since it reflects growth and helps you forecast future revenue. There are two ways to calculate MRR. Add up the monthly revenue you're bringing in from each customer for total MRR. Multiply ARPA by your number of paying customers. The first method takes longer but is also more accurate. If Customer X is paying $200 per month, and Customer Y is paying $400 per month, your MRR would be $600. The second method is easier. If you have four customers, and ARPA is $150, your MRR would be $600. Make sure you're not including one-time payments in your MRR, like implementation and/or limited support fees. Be careful about quarterly, semi-annual, and annual plans as well. Let's say a new customer signs a $1,200 year-long contract in December. If you tally up your MRR on a customer-by-customer basis that month, you might incorrectly add $1,200. But you're not generating $1,200 from this account each month -- you're generating $100. To include these subscription values in your MRR, simply divide them by four, six, or 12 if they're quarterly, semi-annual, or yearly, respectively. New MRR refers to revenue from new customers. Suppose you acquired one customer paying $50 per month and a second customer paying $45 per month. Your new MRR would equal $95 per month. Expansion MRR is considered the "holy grail" of MRR. Why? It's five to 25 times less expensive to retain an existing customer than acquire a new one; plus, customers are far less likely to churn when they've invested more into your suite over time. Churn MRR is the revenue you've lost from customers who have downgraded their plans or canceled altogther. It's a leading indicator of next month's MRR. For example, if two customers each paying $400 canceled in June, your MRR would be $800 lower in July. Annual recurring revenue is your MRR multiplied by 12, or the amount of recurring revenue you'll generate in a calendar year. It has a big advantage over MRR. Because salespeople typically sell more during longer months (like March, August, and December), and sell less during shorter months (like February, June, and April), your predicted MRR might be off from month to month. Since ARR applies to the entire year, monthly variance has no impact. Should You Focus on MRR or ARR? The short answer is, you should focus on both. While MRR tells you how your business is doing on a monthly basis, ARR gives you a yearly picture. Your priority should depend on your company's maturity and business model. If you're generating more than $10 million every year, think in terms of ARR. If you're generating less than that, a shorter-term lens is more helpful. Your churn rate is the percentage of customers who cancel their recurring subscriptions. You can calculate per month, quarter, or year, depending on the most common type of contract you use. Imagine the majority of your customers are on semi-annual plans. In January, you have 400 customers. In June, you have 500 customers. Your churn rate equals: -100 / 500, or -20%. You're gaining more customers than you're losing. No matter what, churn is bad. However, revenue churn is different from customer churn. Revenue churn is the amount of revenue you've lost (a.k.a. churn MRR), while customer churn is the amount of customers you've lost. From a business standpoint, it's probably preferable to lose three customers each paying $40 per month than one customer paying $300 per month. Negative Churn is a term popularized by Skok that means your expansion MRR exceeds your churn MRR. If you can achieve negative churn, your business will grow exponentially. Outside sales teams use many of the same metrics as inside sales teams but prioritize meetings more heavily. Company use these sales development metrics to benchmark their SDR team’s efficiency and ability to grow pipeline. It’s much easier to understand your data and the significance of various metrics in visual form. Every CRM comes with the ability to create dashboards. Some let you choose from pre-set dashboards, while others (like the HubSpot CRM used with the Reporting Add-On) let you build your own to track your most important sales metrics. Create friendly competition by publicly tracking how each salesperson is performing. Pick your sales metrics based on the behavior you want to promote; for example, if you’re trying to increase your team’s prospecting efforts, you might display the number of total opportunities created in the last month. To ensure your reps didn’t chase unqualified leads simply to fill their pipelines, you might also display total sales by rep.
Keep your reps focused on the right tasks with an activities dashboard. Visualize how many days in a row they’ve logged into the CRM, how many calls they’ve made in the past week, how many presentations they’ve given, how many emails they’ve sent, and so on. It’s critical for sales managers to know how the team is trending. Track the value of new opportunities compared to the previous month or quarter, the weighted value of your pipeline, total sales versus your target, and/or close rate by salesperson. If you don’t have a CRM, a KPI template gives you an easy way to track your sales metrics in a single place. This KPI tracking spreadsheet is customizable to your business goals. It includes a step-by-step guide to choosing company-wide KPIs and tabs for selecting KPIs by employee, function, and department, respectively. In addition, the spreadsheet has pre-built formulas to help you tie your KPIs to KRAs. Some teams never track sales metrics at all. Carefully picking which ones to prioritize and then course-correcting (or even completely pivoting) as needed will put you ahead of the game.